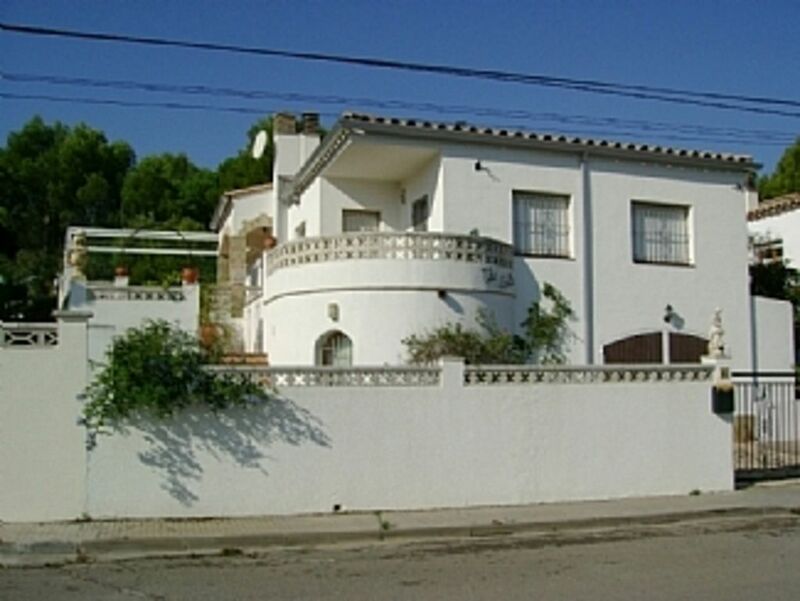 The Castle is a detached villa, with a private pool, extensive patio area, and a roof terrace. The garden/patio areas have recently undergone renovations, the house now boasts an extensive, safe, modern outside area. Inside the house there is a large kitchen diner, fully equipped with all appliances, a separate lounge, with comfortable sofas for those times to relax. There are 3 spacious bedrooms, one double with en-suite shower room and 2 twin rooms, there is also a family bathroom with overhead shower. The Castle is in a bright sunny location which is only a 10 minutes walk to the closest beach in Riells and the marina. En-suite bathroom to bedroom 1 comprises walk-in shower, wc and sink. Family bathroom with full bath and overhead shower, wc, and sink. In master bedroom only. Ceiling fans in other rooms. Bathroom towels are provided, beach/pool towels can be provided for a small charge. The separate lounge has plenty of comfortable seating and leads to a small secluded patio. Equipped with TV, DVD and CD player. Kitchen with dishwasher, washing machine, fridge/freezer, hob, oven and microwave. Plenty of cooking utensils, crockery and cutlery. Spacious with large dining table, doors open directly onto the patio by the pool. Tennis courts can be booked in L'EScala centre. Golf is available within a 15 minute drive. Diving schools close by. Notes on accommodation: Air conditioned Master bedroom. Ceiling fan in lounge and other fans available for the bedrooms. This property is suitable for all age groups, families including young children and elderly will appreciate the space and single level living that the Castle provides. Outside: All the grounds of The Castle are private and only for use by our clients. The pool is large and the area around it has plenty of loungers and a table and chairs. There is a very large terraced area with bbq,tables, lots of seating, umbrellas and wind out awning for shade. There is also an electric awning for the lower patio, ideal for those extremely hot days, a smaller very private terrace is on the roof. There is a large garage and off road parking, however it is rarely difficult to park in this very quiet residential street. Cleaning / Towels / Linen / Maid service: All bed linen and towels for indoor use are provided. The property is cleaned before your arrival and at the end of your stay this is included in the price. Arrived a little later than expected due to traffic but this was not a problem for Ken and Sandra who met us at the house and showed us around. They gave us a quick resume of the area and left us with maps and brochures and an idea of where to go and what to do. The house and pool were well maintained, Ken came out every few days (early, we rarely saw him) to maintain the pool, and nothing was too much trouble when required. The house is in a quiet location, it is only a 10 minute walk down to the front, slightly longer coming back as it is a steady incline, but should not pose a problem for the less mobile. The property has the benefit of a very large outdoor space, with mixed sunshine and shady areas over two levels, with the pool seeing the sun for the majority of the day. I would definitely recommend this property, we stayed as a family with 3 children ranging from 7 to 21 years old, the area offers something for everyone. I would stay here again if we revisit this area of Spain. We have stayed many times in the area and this is great villa for a relaxing family holiday. Sandra and Ken couldn't be more helpful. Upon arrival we met at a convenient location and Sandra and Ken showed us to the villa. Cleanliness was fantastic and everything you require was there. The villa is not on a main road side its quite at night but near enough to walk to the beach. The pool was lovely and everything you could ask for. A great place to explore from including spending a couple of days in Port Aventura for the thrill seekers. Approximately 10/15 minutes walk to Riells beach with its bars, shops and restaurants. A car is recommended if you wish to explore the other beaches in the area. A very pleasant, but longer walk into the old centre of L'Escala with its two smaller beaches. All the beaches in L'Escala are child friendly and have been awarded EU Blue Flags for a number of years. Lots of ble locally. Closest Airport is Girona which is approximately a 40 minute drive and served by many of the budget airlines. Perpignon airport is approx 1 hour by car and Barcelona is approx 2 hours away. We do offer reasonably priced airport transfers to our clients please enquire when booking. Car hire is not essential but recommended if you wish to explore the area. We recommend you check online for special rates during the period of your stay. Apart from the local attractions of L'Escala, including it's many festivals and the Roman ruins in Empuries, it is a great place to explore the Costa Brava. The City of Figueres famous for the Dali Museum is approx 25 minutes drive away. Girona city centre is 45 minutes away by car and Barcelona is 1.5 hours away and a wonderful city to spend time exploring. Being so close to the Pyrenees there are towns suchas Olot and Banyoles in the foothills that are interesting to visit. Water sports are very important in L'Escala and are easily accessible. A wide variety of cuisine and shops are found in the locality. The closest water park is in Roses and is very popular. Booking Notes: A deposit paid by bank transfer is required at the time of booking to secure your dates. The balance is the due 8 weeks before your arrival. Changeover Day: Changeover on Saturday but we are flexible so please enquire if you require other days. The property is ready for you by 4pm and we ask you to kindly vacate by 10am on your day of departure.